Waders are also called shorebirds. This group of birds includes birds that live near the shore of the sea or lakes, but doesn’t include birds like storks and herons (which are bigger) or birds more adapted to ocean life (like gulls). There are 210 species of waders in the world. They like wetlands or coastal area. Most of the Arctic and temperate species migrate but the tropical ones tend to stay put in one place or move according to how much rain there is. Most of them eat small invertebrates which they find in the mud. Different waders will have different lengths of bills. So, they are able to pick up food from the mud in the same place without competing with each other. They have a sensitive nerve at the end of their bills which they use to locate their prey in the mud or soil. Larger Waders will eat larger prey like insects and small reptiles. These larger ones are able to live in drier habitats. 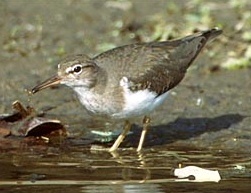 However, the smaller ones will live near the coastal area like the sandpipers. The largest species is Far Eastern Curlew. It is about 63cm (25inches) and 860grams (1.9lb). The Beach Stone-Curlew, or Beach Thick-Knee is the heaviest at about 1kg (2.2lb).